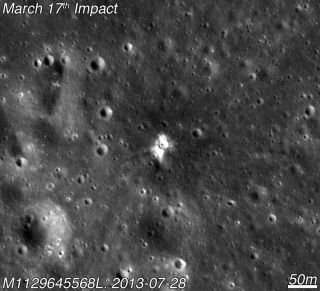 A meteoroid slammed into the moon on March 17, 2013, gouging out a crater 59 feet (18 meters) feet wide on the lunar surface. Trained volunteers with no astronomy experience can pick out craters on the moon as accurately as researchers with five to 50 years' experience, a new study reports. The finding is a boon for CosmoQuest, an organization that has amateurs identify craters on several celestial objects, including the moon, and do other types of astronomy data crunching. This work is then used in scientific studies, and in some cases has been published. The work of individual volunteers is repeated several times to ensure accuracy. "What we can say is that a very large group of volunteers was able to chart these features on the moon just as well as professional researchers," Stuart Robbins, a research scientist at the University of Colorado's Laboratory for Atmospheric and Space Physics, said in a statement. "More importantly, we now have evidence that we can use the power of crowdsourcing to gather more reliable data from the moon than we ever thought was possible before," added Robbins, who led the new study. The study compared the performance of thousands of CosmoQuest volunteers against that of eight scientists, using pictures taken by NASA's Lunar Reconnaissance Orbiter. The participants were asked to identify craters at least 18 pixels across in the pictures (about 35 feet, or 11 meters, in diameter). The area for the images under study was about 1.4 square miles (3.6 square kilometers) on the moon — the equivalent of 1,000 football fields, researchers said. While individual volunteers and scientists saw vastly different numbers of craters in the study area, averages for the two groups were similar statistically. Study team members said the results were "reassuring" for CosmoQuest, which has crater-mapping projects for the moon, Mercury and the protoplanet Vesta. "Put simply, the sky is large, and astronomers need all the help the public can offer," said co-author Pamela Gay, who runs CosmoQuest out of Southern Illinois University Edwardsville. Studying craters allows scientists to better understand how the early solar system came together. By seeing the frequency and age of craters, scientists can then estimate when bombardment of the moon, Earth and other bodies in the solar system was at its most intense. The new study was published March 4 in the journal Icarus.